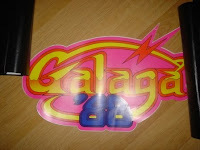 The legacy of Galaga '88 first started with Namco's Galaxian 1979. 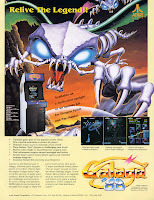 Later the series included Galaga 1981, then followed with Gaplus in 1984. 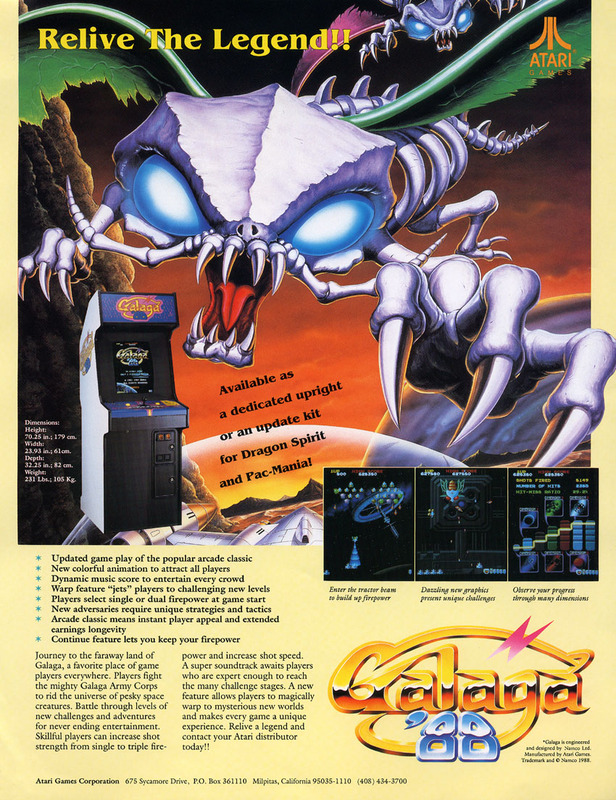 Galaga '88 shared the same cabinet as Pacmania, as well as Dragon Spirit, all produced by Namco with licensing given to Atari. I picked up this cabinet at an auction and got a great deal on it, but the cabinet needed new parts which are hard to find. I was able to slowly track down the NOS side art set 1 piece I found on ebay, another from a KLOV member. The control panel overlay was missing a large chunk, so it needed to be replaced. During the control panel restoration, I simply used paint stripper which helped peel off the old adhesive. I then sanded the control panel down, and painted it. Once the control panel overlay was painted I then applied the NOS control panel overlay. I replaced the micro-switch buttons with yellow leaf buttons. The last step was to redrill a fresh sheet of plexi to help protect the art. This game unlike others in the series does have an ending. It also let's you take on different levels depending on being able to obtain the items, which trigger the dimension warps. Also during the bonus rounds if you don't touch any thing it will give you a secret bonus of 10,000 pts. 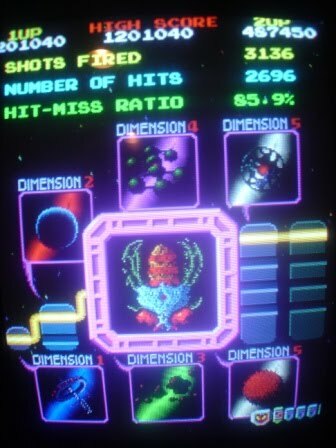 The game play is almost identical to Galaga, except in Galaga '88 you can obtain a triple ship! Most of my Galaga '88 restoration is complete, except for the black generic atari card board needs replacement, along with the atari cone buttons, as well as the original atari logo stick needs to be rebuilt. When you think of lassic video game titles, it's hard not to think of Namco / Midway's Pac-Man from 1980. The game is simple, yet very addictive and of course one of the most popular arcade titles of all time. I knew that I wanted to add a Pac-Man machine into the "Guscade", but I had no intention on obtaining my Pac project so soon. It all started about two weekends ago when a Craigs list ad posted another title in Connecticut. I went to CT with two other members from KLOV, only to find out that the machines which were advertised were not even available for purchase. In frustration we headed back to NY with an empty trailer and decided to call local Craigs list ads while on the road. Initially people did not seem to be budging on their advertised prices; however we were determined to get a good deal after what seemed to be a pointless lengthy road trip. We came up with a game called "Let's play one hundred dollar cab". Some guy listed a dead Williams Defender, and a Galaxian for $600.00, we offered him $200.00 for the pair and told him we had a trailer and were ready to pick them up immediately. The guy said OK, we were all pretty shocked so we figured at this point we might as well at least check them out. We were able to work out a deal and score both cabinets for $150.00 ! The Defender ended up going to one of the other KLOVers and I got the Galaxian, soon to be my Pac-Man cabinet. First a little background on Midway cabinets. 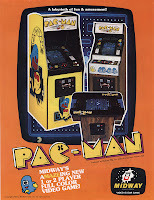 After doing some quick research I found out that Galaxian, and Pac-Man cabinets are both exactly identical. However although similar looking, Ms. Pac-Man, Galaga, & Bosconian are all of the same Midway style cabinets, but are slightly different than Pac-Man and Galaxian. Also Rally-X is very similar except it's a little less deep. When I first picked up the Galaxian cabinet it was more of a hybrid. 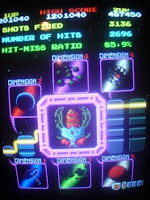 The machine had Galaga '88 side art, a Galaga glass bezel, with the rest of the parts being Glaxian. 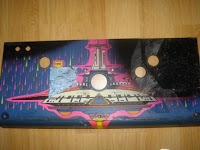 The machine was already painted black and the Galaxian art work underneath was too far gone to recover. 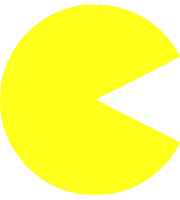 I decided that I've always wanted a Pac-Man, and since it shares the same cabinet style I might as well convert the Galaxian to Pac-Man. 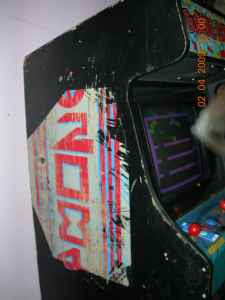 To start with the restoration I first removed the "Galaga '88" side art with a scrapper. Next I applied some paint stripper and removed all of the black paint along with the remaining "Galaxian" original sideart underneath. Began to sand the cabinet down once it was clean enough I was able to prime. In between the coats of primer I used 320 grit sandpaper. A while ago I was able to obtain a N.O.S. (New Old Stock) original Pac-Man marquee from a KLOV member. I knew that I would eventually use the marquee for my future Pac project. Being that it was just about 30 years old the paper backing was stubborn to get off so I needed to use water, and goo-gone. I noticed that after removing the Galaxian marquee, I was going to need to add a light source. Usually Pac-Man and other Midway games during the early 80's had incandescent bulbs. I was told from a member on BYOAC to just add a flourescent under counter light from walmart which was only about $7.00. Since the existing wiring was still intact, I was able to use that and add the fluorescent. This was a cheaper alternative, and saves more energy than traditional incandescents. Also the fluorescent evenly distributes the light behind the marquee. Next I started to work on the Midway coin door. The coin slots were painted over black and shouldn't of been, so I removed them and cleaned them up. Also the coin mechs, the reject buttons were also painted black, so I cleaned those up also using paint stripper. After removing majority of the parts on the coin door; I used more paint stripper, and then revealed the bare metal, sanded, primed and then used "textured black" paint. I bought the control panel fully populated from a KLOV member. When I got the control panel it had the usual paint wear, and needed a new control panel overlay. Again the same process was used with the paint stripper / primer / paint. Added the glass bezel, the PCB of course,completed control panel, NOS marquee, new orange T-molding and after the stencils have been completed my Pac-Man is just about finished! My review of " Barcade " in Brooklyn NY. I went a few months ago, and wanted to share what games they had and what I thought about the atmosphere. Got to Barcade around 11:30pm and it was pretty packed.. It was soo packed that you needed to push people outta the way to walk to a different area. Once around 1am rolled through things began to thin out and the games were alot more accessible. Alot of people were just leaning on some of the games, with girls who had their pocket books and coats on them using them as coat racks..But would be curtius to move their junk if you wanted to play. Also they had the highscore chalk board floating above a row of games lit up which I thought was cool. I wanted to know what other people thought of this place. Personally I felt they had the most classics in one public location closest to my house (NY), but they just need to better maintain them. I understand that it's a Bar and not a private collection. All and all I would say go and check it out, it's worth poppin' by, unless your own private collection trumps it. Most of what's available is pretty much common classics, which appeals to the masses, Some of which are also already available in "Guscade" or might be in the near future. "Now it is the beginning of a fantastic story! Let's make a journey to the cave of monsters! Good Luck!" 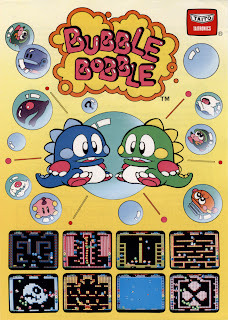 Most people remember the game Bubble Bobble from the port on the Nintendo console, however the arcade version of this classic game has improved graphics and that same annoying theme music that you can't get out of your head. I bought this cabinet off craigslist in MA, long road trip, but well worth it for this gem in my collection. The cabinet was originally a Williams Robotron 2084, and then was at some point converted into a Bubble Bobble. The cabinet was in very rough shape when I snatched it, the wood on the bottom was splintering, and amoung other things was in dire need of a paint job. The wooden control panel was cracked, and also had microswitches installed instead of leafs. I first took the control panel off, and disconnected all of the wiring. The original 2-way restricted wico leaf joysticks were still intact, but I ended up replacing the shafts. The marquee for this game has two different variations, This is the marquee that was distributed in the US by Romstar. This game just like Gun.Smoke, was also a kit-only game and never existed as a dedicated cabinet in the US. The marquee was in nice shape, and only needed to be cleaned. I used a scrapper to peel off the old Romstar generic art, which revealed more of the Robotron 2084 artwork underneath. I then used paint thinner to melt away the old black paint, and then a Dewalt palm sander to smooth out the surface of the bare wood. I added wood filler to the bottom of the cabinet. Also to help protect it from any furthur damage I attached 2 1/2'' casters. I did not want to add any unnecessary height to the cabinet, so I made sure that the casters were short. During the painting process I applied several coats. I needed to also order new T-Molding which was then later applied. I ended up ordering a used williams control panel from a KLOV member but it was in very rough shape, at least it wasn't cracked. The control panel was a combination of both wood and metal, however the metal sheet was recut locally because it was too hacked. Below you can see the generic overlay being peeled off and revealing the original williams art, and the paint thinner hard at work. Finally the new T-Molding, and control panel overlay, and this restoration is just about finished. The only thing currently missing from this project is the button stickers. The button stickers are supposidly going to be reproduced by Rich @ This_Old_Game . Bubble Bobble is certainly a favorite in "Guscade" and is a blast to play and of course extremely addicting.